Methods for monitoring alcohol consumption biomarkers Ethyl Glucuronide (EtG) and Ethyl Sulfate (EtS) are generally limited by poor retention and coelution with matrix interferences, as well as by long analysis times and short column lifetimes. 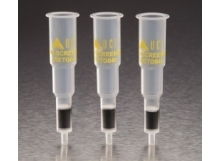 The dilute-and-shoot EtG/EtS LC-MS/MS analysis developed here using the novel Raptor EtG/EtS column easily resolves EtG and EtS from matrix interferences, providing consistent, accurate results for high-throughput labs testing human urine samples for alcohol consumption. Rugged method for 1000+ injection lifetime. Short, 4-minute runtime for high throughput.